This easy to use device can be connected to an in-house or stand-alone exhaust or vacuum system and eliminates the need for charcoal canisters for the scavenging of waste anesthetic gases from breathing circuits and induction chambers. One SI-6 can support up to 6 conventional anesthesia devices. It requires no power source and needs only simple installation. 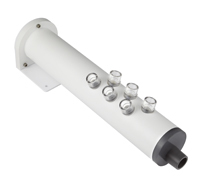 It can be mounted in any orientation without affecting its performance. In use, its proprietary design automatically adjusts for changes in the flow of gases into the interface or for changes in the exhaust source pressure. The negative pressure at the breathing circuits or induction chambers is kept to a minimum, so there is no concern of anesthetic gases being pulled away from the animals under anesthesia. No valves to continually adjust and no reservoir bags to monitor.